located on the Outer Banks of North Carolina. 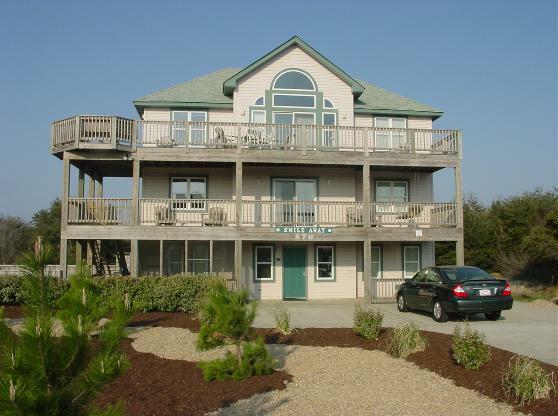 SMILEAWAY is located in Corolla NC, in Whalehead Subdivision. No major streets to cross...just put on your beach scuffs! Rates are CHEAP and highly discounted in the off-season. You will "Smile Away" all your everyday stress in this lovely seaside home. Third Floor offers King master, greatroom, kitchen and powder room. refrigerator, 2 Queen bedrooms (both with their own lockout full baths).